In July 2004, Moscow Medical Examiner, Dr. Sergey Nikitin, Vladimir Konstantinov, (one of Russia's foremost Ground Penetrating Radar specialists) and myself, Captain Peter Sarandinaki, commenced the Third Search for the remains of Tsesarevich Alexie and one of his sisters, either the Grand Duchess Maria or Anastasia at the Pig's Meadow. The Four Brother Mine site is approx. 2 Km SE of the Village of Koptiaki (NW corner of this map). The Pig's Meadow is 3 Km South of Four Brothers along the Koptiaki Road. The Koptiaki Road then leads directly to Ekaterinburg to the South. Dr. Nikitin organized the search and was able to find the proper funding within Russia for this expedition. We had a group of Tajikistanis who worked twelve hours per day digging and preparing the ground for GPR. We eventually used heavy equipment to bring part of the Koptiaki Road level down to 1918. Once the ground was prepared Konstantinov used his GPR to look for anomalies or sites where someone had previously dug. 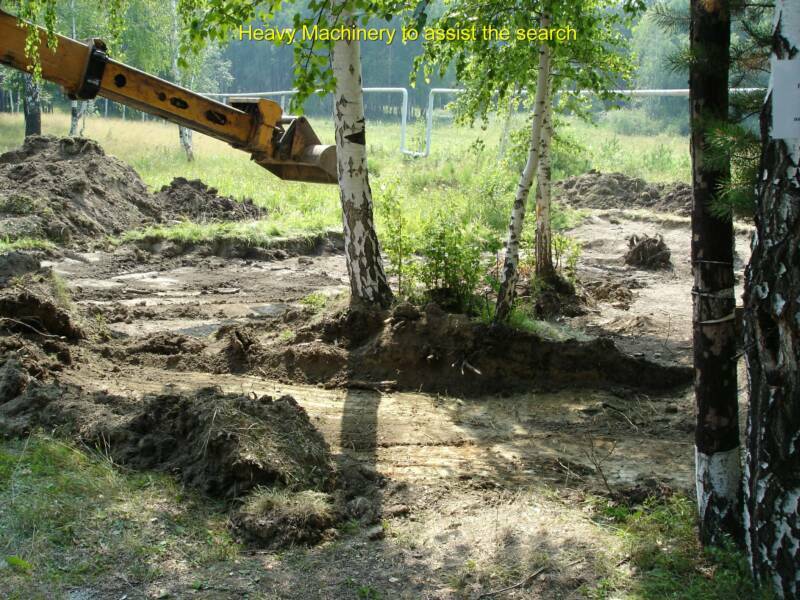 Previous digging had been done at the Pig's Meadow by archeologist Alexeyev and his group which disturbed the search site. We had to re-do their work because each hole they dug up became an anomaly for us. Our Tadjiki diggers were invaluable workers. Vladimir Konstantinov works as a GPR expert for the Russian Federation FBI. He is considered to be an expert in his field. We knew that investigator Nicholas Sokolov had searched many square miles of forest using hundreds of people. They walked through the forest near Four Brothers two meters apart, abreast of each other, but no grave site was found. Sokolov knew that the Reds had built a bridge on the Koptiaki Road so that the truck transporting the corpses would not get stuck. Unfortunately, it never entered his mind to look under the road. Sokolov did not search for a grave at the Pigs Meadow; he only searched the Four Brothers Mine area. We spent three weeks working at the Pig's Meadow. The killers stated that they buried nine remains in a common grave which was here at the Pig's Meadow, and that the other two bodies were buried nearby. We started our search by leveling and digging from the grave site found by Avdonin and worked outwards. We had much ground to cover but managed to open up and search an equivalent of one square acre. There is much work to do. Birch trees had grown throughout the site. We did not have the means to search under those trees without having to cut them down and removing the roots. We decided not to disturb any trees, because our GPR expert informed us that the next time we shall conduct our search he will bring special equipment which will enable us to observe the ground underneath any standing tree. The use of heavy machinery minimized th physical labor and allowed the site to be not only to be leveled to the ground but to scrape off 10 cm of top soil,but bringing the level of the ground down to what it was in 1918. The site was now ready for Konstantinov to go over it with his GPR. We had photgraphs from the Russian archives of the Pig's Meadow. 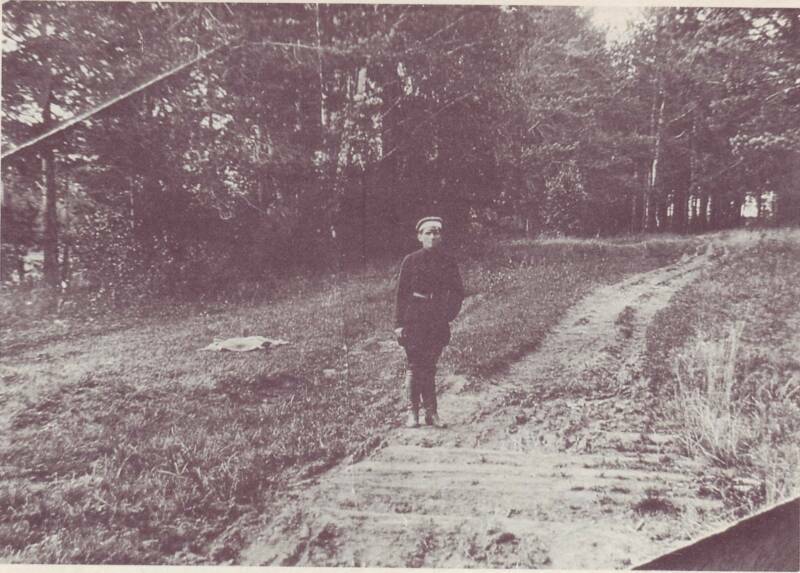 One photograph stands out above all and that is the photo taken of the killer Ermakov as he stood on the Bridge at the Pig's Meadow. He wrote the following in the back of the photograph: "I am standing on the grave of the Tsar." We still have the energy and will to continue the searches but require the necessary funds to complete the project. Our goal is to find the remains of Tsarevich Alexis and one of his sisters so that the Romanov Imperial Family can rest in peace, together, and close this sad chapter in Russia's history.